The Daily Mail is furious because an “openly gay” judge delivered a ruling on Brexit today. The High Court today ruled that the UK government can only trigger the process for leaving the European Union via a vote in Parliament, following the EU referendum earlier this year. The news has not gone down well among Brexit campaigners, who had hoped that Prime Minister Theresa May would be able to use executive power to make the decision without consulting MPs, who oppose plans for a ‘Hard Brexit’. The pro-Brexit Daily Mail was naturally very upset about the ruling – running a profile on the “three judges who blocked Brexit”. The case was overseen by some of the country’s most senior judges – Lord Chief Justice Baron Thomas of Cwmgiedd, Head of Civil Justice Sir Terence Etherton and Lord Justice of Appeal Sir Philip Sales. Referring to the group, the newspaper initially fumed: “The judges who blocked Brexit: One who founded a EUROPEAN law group, another charged the taxpayer millions for advice, and the third is an openly gay ex-Olympic fencer”. After being roundly mocked on social media, the newspaper changed the headline to omit reference to the third judge. 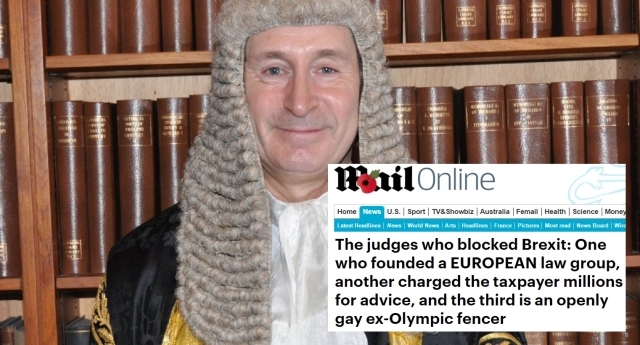 The “openly gay ex-Olympic fencer” in the headline refers to Sir Terence Etherton, the country’s second-most senior judge, who has more than four decades of legal experience. The justice, who qualified for the 1980 Summer Olympics in Moscow as a fencer, entered a civil partnership in 2006 and converted to a marriage in 2014. When appointed as Lord Justice of Appeal in 2008, he said: “My appointment also shows that diversity in sexuality is not a bar to preferment up to the highest levels of the judiciary”.